Photo: Joseph Borst House, ca. 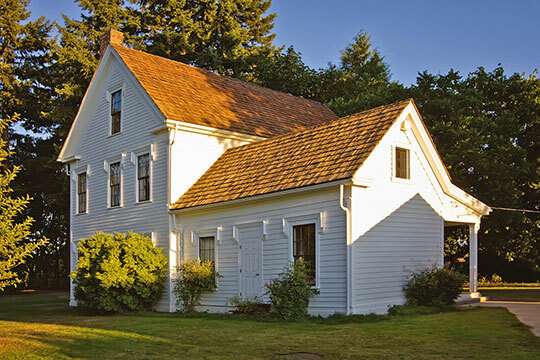 1857, 302 Bryden Avenue, Centralia, WA. Listed on the National Register of Historic Places in 1977. Photographed by User:Steven Pavlov (own work), 2011, [cc-by-3.0 (creativecommons.org/licenses/by/3.0)], via Wikimedia Commons, accessed March, 2015. The Lewis County Courthouse is located at 345 West Main Street, Chehalis, WA 98532; phone: 360-740-1203. Lewis County, located in the southwest part of Washington State, touches eight other Washington counties. Grays Harbor, Thurston, and Pierce Counties to the north; Yakima County to the east; and Skamania, Cowlitz, and Wahkiakum Counties to the south; and Pacific County to the west. The boundaries are purely political creations except for that portion of the northern boundary that briefly parallels the Nisqually River, and all of the eastern boundary which tracks along the crest of the Cascade Mountains. Lewis is the largest county in western Washington; it covers 2,452 square miles and measures about 90 miles (east to west) by 25 miles (north to south). The topography varies widely, from the broad, relatively flat and low-lying western section of the county to the Cascade Mountains to the east. Roughly three-fourths of the county is rugged, mountainous and forested. The remainder is characterized by low rolling hills interspersed with rivers and tributaries including the Cowlitz, Chehalis, and Newaukum systems. The major population centers of Chehalis and Centralia, are located on the flood plains of the Chehalis River and its tributaries, including the Skookumchuck and Newaukum rivers. The county contains portions of the Snoqualmie and Gifford Pinchot National Forests and Mt. Rainier National Park. Approximately one-third of Lewis County is designated as national forest. The mountainous eastern portion of the county tends to protect the western areas from icy temperatures; the Pacific Ocean to the west also serves as a moderating influence on the weather. Consequently, the climate of the more heavily populated areas is generally moderate with warm dry summers, long rainy winters, and few extremes. Lewis County Washington Comprehensive Plan, 2008, www.lewiscountywa.gov, accessed March, 2015.